Povidone Iodine is a broad-range antimicrobial that kills bacteria, fungi, viruses, protozoa and yeast. This form of iodine provides skin protection against microbes until the solution is washed from the skin. 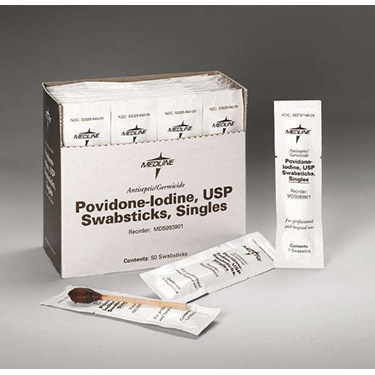 Each swabstick is saturated with a 10% PVP-I, USP solution equivalent to 1% available iodine. Package arrived next day. Great service, great product! Pros:Swabs are easy for 90-yr. told self-cather to use, easy to get out of sleeve. Ideal for travel.